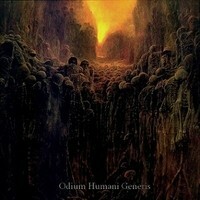 Also amongst the recent spree of Black releases is WELTSCHMERZ's "Odium Humani Generis". This turned out to be one of the few releases, this year, that truly harkens back to the 'good ol' days' of Black Metal, as it solemnly bows (bangs) it's head with staunchly crossed arms and planted feet. To even at least somewhat meet modern preconceptions of production standards, and still sound irrevocably raw, is hard to achieve. "Ab Aeterno" is the first step into the darkening, foggy abyss that is this album. A thick, speedily aggressive intro blast-beats the point home, though this soon and steadily tapers out into a wistful, subtly rhythmic pulse, accompanied by teetering atmospherics. That is, until, the metal comes back in full force. This track is perhaps one of the strongest indicators on this album, of what this band's music is about; the elements that made true Black Metal, truly black. The rawness and unforgiving nature of the riffs, and the nihility of the lyrics. The latter is especially continued immediately in "Ending Your Life", whose riffs are noticeably Thrash-based, with such inflections even present in the vocals, which deliver an ever-chilling pre-disposed reality. "Homo Homini Lupus" involves the use of foreboding, and even going as far as depressing, chord progressions, whose razor-edged arrangements evoke pain and suffering. The embellishments of the slick tremolos add to what is truly a beautiful melodic timbre within this track, which is displayed in full in the slower sections, hypnotising clean-guitars brought to bear. Any solemn peace and tranquility is snatched away with the onset of the returning riffs of pure metal. "The Night is My Domain", closes the album on a particular bleak note. As well as holding a great song title, it has to be my favorite on the record. At nearly 8 minutes long, it contains all of the band's obvious elements, and more; it's progressions operate along an unpredictable path, yet with a followable fluidity, and each passage is different to the previous. It's hard to conceptualize this band into that of "modern Black Metal", or that which pays earnest homage to such music of the 90's. I would argue it does both seamlessly, with rugged grace.